Nothing wrong with a little rookie hazing… right Dez Bryant? Just ask Florida Marlins reliever Jose Ceda who was locked in the bullpen bathroom during a game at the Phillies’ Citizen Bank Park. The Florida Marlins season is all but over. While the Marlins won’t be heading to the post season, that doesn’t mean they can’t have a little fun and ended the season by hazing the rookies. 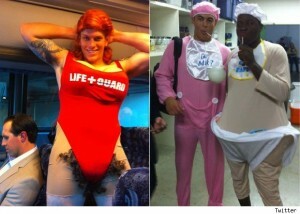 While on their final road trip from Milwaukee to Arizona, the Marlins passed the time by making the rookies dress up in drag. A little hazing never hurt anyone (take note Dez Bryant), and the pictures were posted on Twitter. On Sunday, Florida Marlins outfielder Chris Coghlan pied teammate Wes Helms during a TV interview. Helms scored the game-ending single against the Atlanta Braves and was congratulated with a new team tradition. It is now being reported that Coghlan tore his meniscus during the post-celebration pie throw and will be sent to the DL. Coghlan received an MRI on Monday and discovered he might need surgery. Coghlan was last year’s NL Rookie of the year. If surgery is required, Coghlan would miss 6-8 weeks.